Studio/ workshop available at the center of ART HOP! Workshop/Office & Sales Space at Alchemy -- South End artists looking to share studio or office space with an opportunity to sell your artwork in a lovely gallery setting in the heart of Art Hop and on Pine St next to Arts Riot! Non- Jewelry makers welcome! One of 3 studios in a bright, open-concept, 100 yr old building. We have a retail gallery and a behind the scenes larger workshop/office space in our 2000 sq ft space with regular open shop hours staffed by the two owners of Alchemy. We currently have 3 people in this large space-soon to be 2 people. We are located between Dealer.com, and Arts Riot on Pine Street and in the heart of the South Ends Art District/Art Hop. Approx. 200 sq feet includes parking, bathroom, shared kitchen area, concrete floor, utilities, internet, and security system. $450/mo. (negotiable) One studio Available now and another studio available in August. Also a possibility for 400 square foot space, if needed. We will be closed on Saturday July 2nd! We are wishing everyone a great long weekend! Alchemy is celebrating it's seventh anniversary! 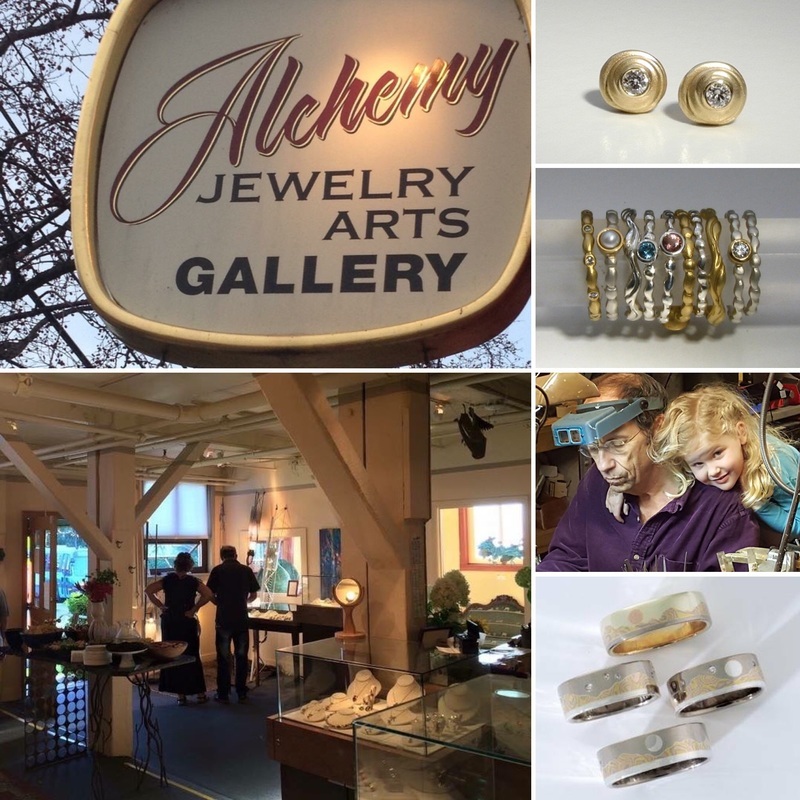 Alchemy Jewelry Arts Gallery is celebrating its 7th anniversary! We are going full force with exciting plans at Alchemy. In addition to our own jewelry collections, we are bringing in the collections of several more designer goldsmiths with fresh and vibrant styles. We are thrilled to continue to offer fine and custom jewelry designs made on site, in the heart of Burlington's South End Arts District, as well as Vermont artisan paintings and sculpture throughout the gallery. So much has happened since we opened our doors in 2009! Timothy and Susan are scaling back and hoping to spend more time in a canoe and with their grandkids. You will find many of Timothy’s fabulous designs next time you visit us and he is still creating at his bench in the studio. Jane Frank decided to focus on a new venture of teaching and making jewelry in her home studio. We feel so fortunate to have had the chance to co-create this beautiful gallery and work alongside such talented Vermont artists. We are excited for this new chapter at Alchemy Jewelry Arts Gallery and we invite you to be part of our continued adventures! Connie Coleman and Marie-Josee Lamarche are both moms of two wonderful children. They love spending time with their families and the flexibility of being stay at home moms/business owners. As co-owners of Alchemy Jewelry Arts Gallery, they share the love of jewelry design & fabrication. The sweetest moments in our work come from sharing the heartfelt and loving stories of our amazing clients when they choose our jewelry designs as gifts for their loved ones!